Claiming to be the birthplace of the hotdog, a visit to Coney Island isn't complete without sampling the yummy street food along the boardwalk. While filling one's stomach, they can gaze upon the fireworks which light up the sky each Friday around 9.30pm. The activities and amusements at Coney Island are in full swing from May to September, but many attractions close outside these months. 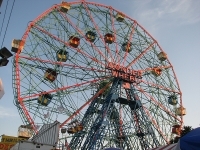 There is no accommodation on Coney Island, but it makes a great day out for the whole family.